New home construction in Commerce City, Colorado. The suburbanization of America marches on. Population growth in big cities slowed for the fifth-straight year in 2016,1 according to new census data, while population growth accelerated in the more sprawling counties that surround them. Those figures run counter to the “urban revival” narrative that has been widely discussed in recent years. That revival is real, but it has mostly been for rich, educated people in particular hyperurban neighborhoods rather than a broad-based return to city living. To be sure, college-educated millennials — at least those without school-age kids — took to the city, and better-paying jobs have shifted there, too. But other groups — older adults, families with kids in school, and people of all ages with lower incomes — either can’t afford or don’t want an urban address. Worst off were rural areas. Counties outside of metropolitan areas, where 14 percent of Americans live, shrank slightly (-0.04 percent) in 2016, the sixth-straight year of population decline. Nonmetro areas in the Northeast and Midwest had larger losses. Nonmetro America has the slowest job and wage growth, as well. “Large metros” are those with at least 500,000 population as of the 2010 census. Two types of smaller places saw surprisingly strong growth. First, population growth accelerated in many midsize metros in the Northwest. Among all metros with at least 250,000 population, four of the 10 areas where growth accelerated most from 2015 to 2016 were in Washington (Olympia and Spokane) or Oregon (Eugene and Salem); another northwestern city, Boise, Idaho, was also on the list. Second, unlike rural areas overall, educated rural areas grew, too. In nonmetropolitan counties where at least 30 percent of adults have a bachelor’s degree, population grew 0.8 percent in 2016 — slightly ahead of national population growth of 0.7 percent. Even better, growth in these educated rural areas is accelerating and is at its highest rate in eight years. Other places, though, are growing more slowly or even shrinking. Of the 104 metros with at least 500,000 people, 16 lost population.5 All but one (Honolulu) of these 16 were in the Northeast and Midwest, and the 10 that lost most included seven across eastern Ohio, upstate New York and Pennsylvania. Chicago was the largest metro to lose population in 2016. Many of these areas are former manufacturing strongholds that are now struggling economically. During the shale boom of the late 2000s and early 2010s, oil and gas hubs such as Williston, North Dakota, and Midland, Texas, were among the fastest-growing parts of the country. More recently, however, drilling has slowed, jobs have left town, and people are doing the same. Williston swung from 10.1 percent growth in 2015 to a 3.0 percent loss in 2016. Dickinson, North Dakota, and Midland and Odessa, Texas, also lost people in 2016 after growing sharply in 2015. Among larger metros, Houston’s population growth slowed the most, from 2.5 percent in 2015 to 1.9 percent in 2016 (Houston actually lost jobs in 2016). More surprising, growth decelerated almost as much in San Francisco, San Jose and Denver. Their population slowdowns, though, were accompanied by big wage gains (in the Bay Area) or large home-price increases (Denver), suggesting that limited housing or high costs, not weak demand, is holding back growth in those areas. Year-to-year population shifts can be noisy, the result of one-off changes in local industries or economies. It’s better, therefore, to focus on the broader pattern of population growth over time. The 2016 data suggests that the past is reasserting itself. 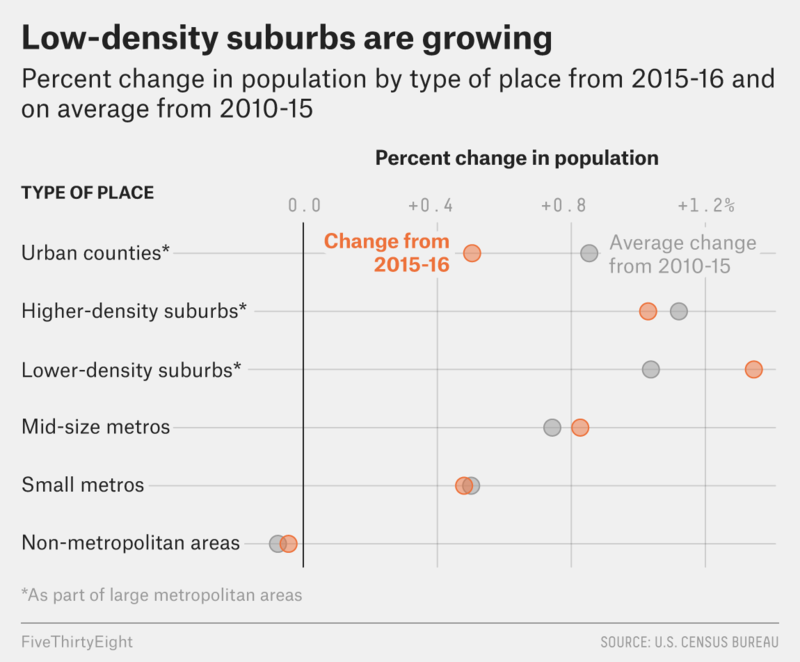 In the last decades of the 20th century, the fastest growth was in the lower-density suburbs of large metros, with midsize and smaller metros growing more slowly and nonmetro counties lagging — just as in 2016. And, in those earlier decades, growth in the South and West far outpaced that in the Northeast and Midwest — as in 2016. For individual counties, the correlation between growth in 2016 and growth from 1980 to 2000 is very high, at 0.72, and has been increasing in recent years: The further we get from the years before the housing bubble, the more population growth patterns look like the pre-bubble era. Of the 10 fastest-growing large metros today, all but Charleston, South Carolina, had rapid growth in the 1980s and 1990s, and all of the 10 slowest-growing large metros today were near the bottom of the pack then, too. For all of the changes this century has brought — demographic shifts, the housing bubble, the Great Recession — and even with increasing wealth of many big cities, U.S. population growth is settling back into familiar habits rather than finding a new path. Figures are through July of each year. Metropolitan areas were classified by population as large (1,000,000 people or more), midsize (250,000-999,999), or small (less than 250,000), based on the 2010 Census population and the 2015 metropolitan area definitions. Micropolitan areas were classified as nonmetropolitan. Within large metros, counties were classified by tract-weighted household density as urban (2,000 households per square mile or more), higher-density suburban (1,000-1,999), or lower-density suburban (less than 1,000). Many counties are large and contain both dense urban neighborhoods and suburban areas. Data for smaller geographic areas than counties confirm that population growth is fastest in lower-density suburban areas, though faster in the highest-density urban neighborhoods than in other urban neighborhoods. According to Census-defined regions, which consider Texas part of the South region. Detroit barely avoided the population-loss club, gaining 79 people in 2016.